I loved making today's card. 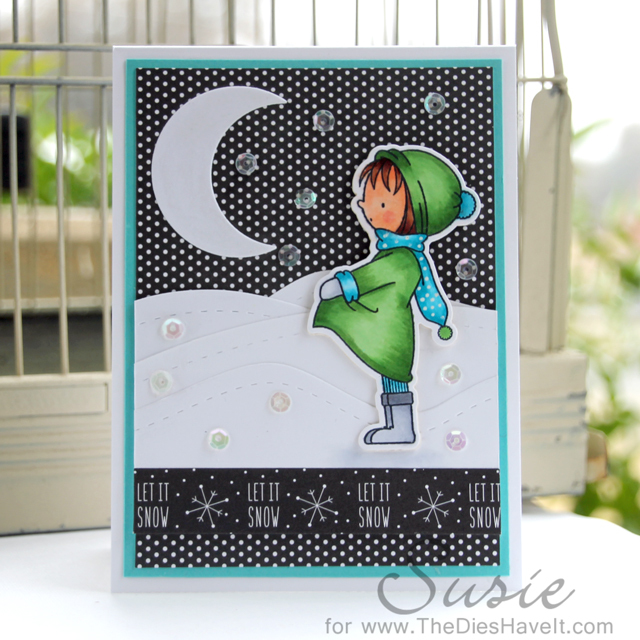 I love to color and this little gal from MFT Stamps is a dream to color. I had the best time trying to get everything shadowed and I might have even succeeded. Anyway, the little girl and the moon die cuts are both from MFT Stamps. I cut the slopes using dies from Simon Says Stamp. The patterned papers are from last year's Lawn Fawn six by six Christmas paper pad. Of course I had to add some sequins to represent the snow my sweetie is trying to catch in her coat. They are from Pretty Pink Posh. I have this gal ready to color again, but I think I will wait until January and use some light pinks and greys. I wanted to mention that I rarely make a card without using my Perfect Layers tools and my MISTI. Be sure to check out the links to the right of this post to find out more about these great tools. You will be hooked once you start using them! I hope you have a wonderful day and I'll see you right back here tomorrow.